So, I started Whole30 last Friday. This was precipitated by a Thursday evening where Sydney and I stayed up until 1 a.m. drinking bourbon cocktails, after ordering a movie OnDemand, pausing it as the 20th Century Fox intro started and then continuing to gab at each other for five hours. Five. Hours. We never did hit un-pause, and at one point Sydney told me that she could see two of me. I wasn't much better off. Furthermore, from the rare time to time, I smoke. Usually a night out or a visit home to Ohio. Recently, I found a pack of cigarettes in my Bundt pan. Yes, that's where I keep them. Ain't nobody in my house looking in the Bundt pan but me. So, there was a cigarette or two that night. Now I love food. Cooking it, eating it, talking about it, thinking about it. It's May and I'm already contemplating about what kind of birthday cake I'm going to have in August. Fortunately the love of food, and cooking, helps out a lot when I'm trying to eat well. When I was a kid I was overweight, always about 10 lbs. heavier than I should be. Then in college I gained a lot of weight. Beer, pizza, the dining hall, and then a serious bout of depression left me standing on a scale that read 203 lbs. I was 19 and wasting my life. So I started cooking every bite I ate and cutting out most carbs. A year later I was 145 lbs. When I was married, ten years later, I had maintained 130 lbs. for many years. I'm just two years away from 40 now and after moving the suburbs, my weight has crept up about 5-10 pounds, depending on how much cheese and wine I'm housing that week. 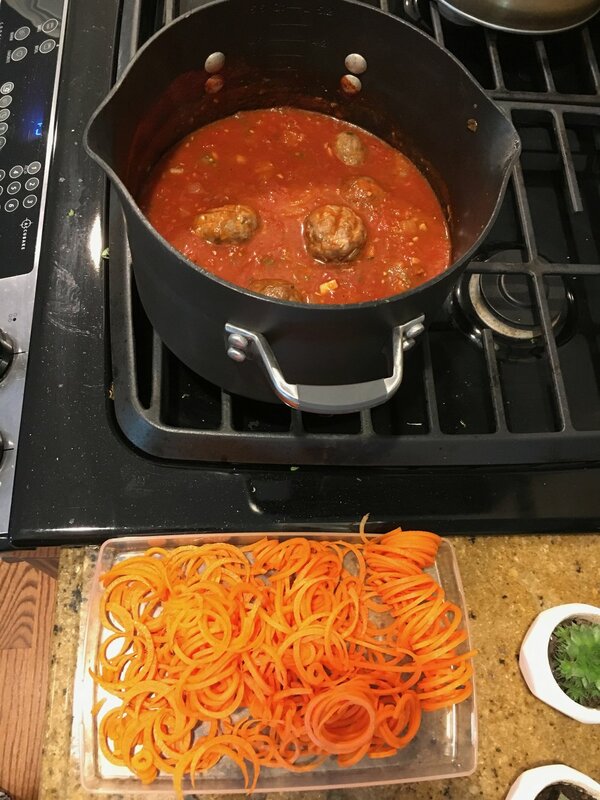 So, here I am eating marinara and meatballs over spiralized carrots. (Surprisingly delicious, by the way. The sweetness of the carrots balances out the acid of the marinara. I'll do it again). Yesterday was day 4 on Whole30. The Internet claims that if you make it three days, you will wake up feeling like one million dollars on day 4. Lies. I had to 1-2-3 breathe through my entire day. "Mom, I spilled the fish food all over my carpet. Again." "1-2-3." Older kid clotheslining younger kid and then laughing as younger kid struggles to breath. "1-2-3." Lord knows, most days that's why I'm reaching for a glass of wine at 3:57. In my mind, 5 p.m. happy hour is for people who get up at 8 a.m. Since I get up well before 7, I'm allowed to have happy hour at 4 and 3:57 might as well be 4. Feel free to use my justification, mom friends. Now it's not chocolate pudding. It's bananas and chia seeds. But it tasted pretty damn good. And I did wake up this morning on Day 5 feeling kind of great and have not had the desire to punch a single person in the throat. And it's almost noon! Blend the first three ingredients 1-2 minutes, until kind of foamy. Put 1 T. each of chia seeds in 2 pint mason jars. Divide the chocolate mix between the two jars evenly. Stir very well so there are no seeds sticking to the bottom. Refrigerate for at least an hour, and up 3 days. Top with whatever. 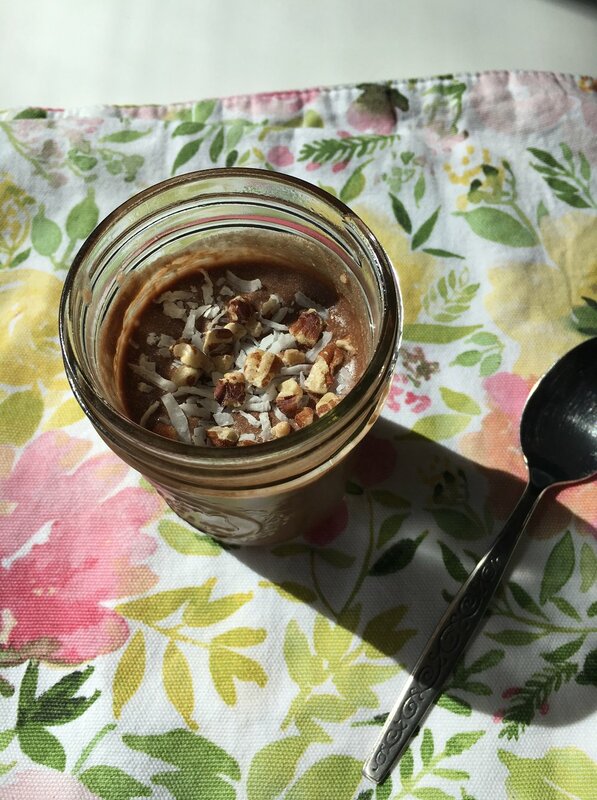 I ate it plain the first time and with a laughably small amount of coconut and pecans the second time. Both were good.